Ancient Stones - Lothian - 033 Stone, Yorkston, Gorebridge. 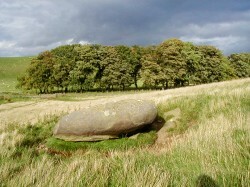 A large glacial erratic resting on smaller boulders and located on a slight slope near a field boundary. The stone measures approx. 2.50m x 1.70m x 0.90 high and is a distinctive "pear" shape. The stone is located near Yorkston farm and may had some past association, possibly even being the York Stone? It has probably been moved from it's original location to allow for cultivation. There are no references to this stone ever having been standing. 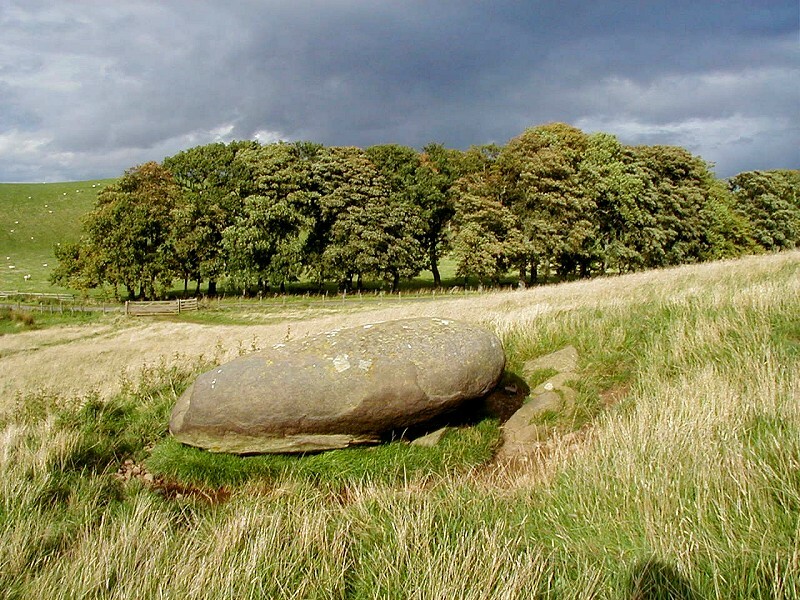 The massive stone is located about 20m from a field gate on a minor road to the east of Yorkston Farm at Roseberry Reservoir, just off the B6372 Penicuik to Temple road. Park at the t-junction a few hundred metres to the south of Yorkston Farm and walk east along the road. I first noticed this amazing stone during cycling trips in and around the area and what drew my attention was its sheer size, being much larger than the normal field clearance boulders you see littered about the fields and also it’s unusual shape. It's unlikely the stone has any antiquarian history and has probably simply been left there as it’s too large to be easily removed. Saying that, present day farm machinery would have no trouble moving it and it may have been dragged there before powerful tractors were available. The name, "Yorkston" throws little light on the stone, the meaning being "quiet town".